Make my collection open access! I just sent this message to my library to tell them how much I want to support Knowledge Unlatched - let's make open access to scholarly monographs a reality! I would like to dedicate up to the remainder of my new faculty start-up fund to support this project (capped maximum of US $1,680). For the future, I would wholly support dropping the big deals of every large publisher and re-directing funding to support works like this. As a bit of context, at the University of Ottawa we new faculty members have the good fortune of having a $2,000 start-up fund to build the collection. My open access policy post has just been published in the London School of Economics Impact Blog. The text follows. Note that this was written before the Canadian tri-agency draft open access policy was released on October 15, but correctly predicts expansion of the CIHR policy basics across the funding agencies. My comments on the tri-agency policy are posted here. The ACOA / APLAC response draft is posted here. Les avocats pour libre accès canadien (APLAC):Réponse préliminaire a la version préliminaire de la Politique de libre accès des trois organismes. Les membres fondateurs d'ACOA / APLAC voudraient vous inviter à joindre une réponse commune a la version préliminaire de la Politique de libre accès des trois organismes. The founding members of ACOA / APLAC invite you to join in a common response to the tri-agency open access policy. Canada's tricouncil funding agencies (NSERC, CIHR and SSHRC) have posted a consultation on their draft open access policy. Comments are due by December 13, 2013. Following are my comments. Kudos to the tricouncil for an overall sensible draft open access policy that in many respects can serve as a model for other funding agencies. One of the strengths of the policy is that open access publishing is an option, not a requirement, with use of grant funds allowed for this purpose. The reason this is a strength is that this permits market forces to operate. This is important to address a long-term market dysfunction in which a few large commercial scholarly publishers enjoy hefty profit margins in the range of 30-40% in an inelastic market that does not respond to market signals such as deep cuts to universities and research budgets, while on the other hand a significant portion of scholarly journal and monograph publishing requires subsidy. 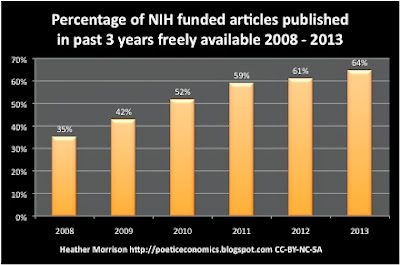 Today's technology makes it possible to conduct high quality scholarly publishing (peer review coordination and editing) at a fraction of the costs of some of the large commercial publishers, suggesting that it is very much worthwhile pursuing a competitive market so that funding can be re-directed from paying for publication to more money for research per se, as well as new needs such as research data retention, management and preservation. See the Appendix to this letter for more detail. 3.1 Option #1: Grant recipients submit their manuscript to a journal that offers immediate open access to published articles, or offers open access to published articles within 12 months. Suggested change - add: and deposit a copy of the final peer-reviewed full-text manuscript in a Canadian open access archive on acceptance for publication, with open access delayed if necessary. Rationale: option #1 is not sufficient to ensure ongoing open access. The policy applies to grantees, not to journals. If a grantee meets the requirements by publishing in a journal that fits the criteria for this option, there is nothing to stop the journal from subsequently changing journal policy, for example changing its business model to toll access or extending the embargo period. This is true even for journals that use Creative Commons licenses; these extend and clarify permissions downstream but pose no obligations on the original copyright holder. Option #2: Grant recipients archive the final peer-reviewed full-text manuscript in a digital archive where it will be freely accessible within 12 months (e.g., institutional repository or discipline-based repository). It is the responsibility of the grant recipient to determine which publishers allow authors to retain copyright and/or allow authors to archive journal publications in accordance with funding agency policies. Option #2: Grant recipients archive the final peer-reviewed full-text manuscript in a Canadian-based digital archive on acceptance for publication where it will be freely accessible within 12 months (e.g., institutional repository or discipline-based repository). It is the responsibility of the grant recipient to ensure that they retain rights to archive journal publications in accordance with funding agency policies. Ensuring ongoing open access to Canadian works is best served through archives based in Canada. Archives based elsewhere are subject to funding contingencies that are not under the control of Canada and access to archives outside of the country could be impacted by forces not under the control of Canada or Canadians. For example, if a grantee fulfills the requirement of this policy by depositing a copy of a work into an archive in a foreign country, it is within the realm of the possible that the foreign archive could be under the control of a country with which Canada is at war or in a trade dispute. To facilitate compliance, authors should be required to deposit a copy of their post-peer-reviewed manuscript on acceptance for publication, with delay in open access if necessary. This greatly simplifies the process of accountability. The original statement places more emphasis on publisher rights than is warranted. Research funding agencies have the right to set policies with which grantees must comply, and copyright begins with the author. Authors should insist on rights retention rather than passively complying with publisher policy. Requiring deposit in a local open access archive is not an onerous burden, and is much less of a burden today than it was a few years ago. The majority of Canada's universities already have institutional repositories in place, and all Canadian research institutions will need to develop repository services in the near future, whether for this policy or for other purposes. For example, every institution with graduate students either has, or will soon need, a repository for electronic deposit of theses. Every institution with researchers will soon need one or more repositories for storing research data. A few years ago development of an institutional repository required local expertise and considerable investment, but today hosted solutions are available and affordable, and smaller institutions can share repositories and save quite a bit on the costs. The embargo period of 12 months is, in my opinion, far too generous. Scholarly publishers have had more than a decade to adjust to open access. The purpose of scholarly research is to advance our knowledge and serve the public interest; any financial benefits to scholarly publishers is incidental and should be given an accordingly lower priority. The embargo period should be shortened to 6 months, with an indication of review with a view to eventually eliminating the embargo period. One suggestion to facilitate both acceptance and compliance would be for the tricouncil to accept URLs to works in institutional repositories in CVs for grant application purposes. This would mean that the small steps needed to make works open access would also free up time for researchers. Thank you for a good model for open access policy and for the opportunity to participate in this consultation. Researchers can save money by selecting more cost effective options such as publishing in one of the majority of open access journals that do not charge article processing fees. Of the close to 10,000 fully open access, peer-reviewed scholarly journals listed in the Directory of Open Access Journals, 6,555 or approximately two-thirds have "no article processing charge" (DOAJ, 2013). Researchers considering open access journals that do charge article processing fees have an incentive to prioritize journals equivalent in scholarly value but lower in cost where possible, as seeking lower costs means more research funds can go to other priorities such as support for student training and purchase of necessary equipment. Today's technology has made it possible to complete the important scholarly work of coordinating peer review and editing at a very high level of quality at a fraction of the cost associated with some of the large commercial scholarly publishers. According to my analysis (Morrison, 2013), the average global expenditure by university libraries for each peer-reviewed scholarly article is approximately $4,500. To illustrate the potential for savings, note (merely as one of many examples) that the profitable Hindawi manages the process charging article processing fees as little as a tenth of this amount. MORRISON, Heather. Economics of scholarly communication in transition. First Monday, [S.l. ], may. 2013. ISSN 13960466. Available at: <http://firstmonday.org/ojs/index.php/fm/article/view/4370/3685>. Date accessed: 16 Oct. 2013. doi:10.5210/fm.v18i6.4370. This issue of the Dramatic Growth of Open Access is dedicated to the hard-working staff at the US PubMedCentral who have done so much to make open access happen and are now on furlough. These charts show the steady increase in numbers and percentages of articles funded by NIH that are freely available within 3 years of publication. Since 2008, the percentage has increased from 35% to 64%. Aside from thanking the researchers, the reason that I have selected this as an issue to highlight is to point out that the U.S. government shutdown is a major concern for scholarship as a whole, not just open access scholarship. When the world's largest medical research funding agency is shut down, research funds do not flow. Equipment cannot be bought or research assistants hired. When the total quantity of research decreases, there will be less need for publication, whether toll or open access. For anyone with a genuine concern to advance knowledge, this should be the focus. This is incidentally intended to add to my critical comments on the Bohannon / Science article focusing on poor peer review at a few new journals. I argue that the fact that Science would choose this as a focus at this moment in time suggests a publisher out of touch with the realities of the research communities. If the U.S. government shutdown continues, I predict a drop in scholarly research outputs. The open access journals listed in DOAJ are growing significantly in number of journals and article searchable at article level. The number of journals searchable at the article level grew this quarter grew by 660 to a total of 5,597, a total of 7 new journals searchable per day. The number of articles searchable via DOAJ at article level is now 1.5 million, a growth of 386,000 this quarter. DOAJ now has a browse by publication charge feature which makes it easy to illustrate that about two-thirds of the journals listed in DOAJ do NOT charge article processing fees. Internet Archive continues to amaze, adding 10 billion webpages this quarter for a total of 357 billion webpages. The number of texts freely available through the Internet Archive is over 5 million, with half a million added this quarter. 121 countries. Growth this quarter: 1 country. 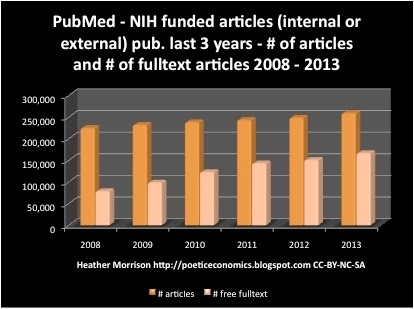 5,597 journals searchable at article level. Growth this quarter: 660 journals (7 per day). 1,517,338 articles searchable at article level. Growth this quarter: 386,957 articles (over 4,000 per day). 34% growth this quarter. New: browse by publication fee. This browse feature demonstrates that the vast majority of OA journals do not use article processing charges. 54 publishers. Growth this quarter: 5 publishers. # of journals that can be read free of charge: 42,115 journals. Growth this quarter: 1,487 journals. # free fulltext articles: 2,288,352. Decrease of 31,907 articles. total # of articles: 7,114,008. Decrease of 9,063 articles. completely free sites: 84. Growth of 11 sites this quarter. Sites with free back issues: 279. Growth of 1 this quarter. # open access repositories: 2,452. Growth of 130 this quarter. # open access repositories: 3,511. Growth of 130 this quarter. # of documents: 50,063,294. Growth this quarter: 2,915,212. # of content providers: 2,690. Growth this quarter: 83.
journals actively participating in PMC: 1,647. Growth this quarter: 91 journals. # journals in PMC with immediate free access: 1,133. Growth this quarter: 32 journals. # journals with all articles open access: 996. Growth this quarter: 36 journals. Webpages: 357 billion. Growth this quarter: 10 billion. The Bohannon "study" published in Science may have consequences beyond what was intended. In brief, Bohannon picked a list of journals largely from the list identified by Beall as predatory and submitted a bogus article that should have not passed peer review. A large number of journals accepted the article for publication. There is some benefit to this study as it confirms a problem first identified by Beall. However, this article reveals more problems than Bohannon or Science thought. First of all, this is a problematic study in itself, published in a prestigious journal but the Bohannon study itself was not peer reviewed, and I argue that no responsible peer reviewer or serious scholarly journal should have published this article in its existing form. Because the journals were cherry-picked from a list of journals known to be problematic, the logical conclusions at most provide supporting evidence for Beall's qualitative work. These results are clearly not generalizable, and the extent of the problem may be quite small (there are close to 10,000 fully open access journals listed in the Directory of Open Access Journals; the 157 journals that accepted this article, most not listed in the vetted DOAJ list, represent about 1.5% of open access journals. This study did not conduct a control group, submitting articles to subscription journals; nor did the author mention the literature on similar hoaxes with subscription journals, a substantive omission that should have been picked up by competent peer review and/or academic editing. More worrying, however, is that while Bohannon and Science may have meant this as an attack on open access, this study could easily be picked up by those who oppose science and scholarship. For example, an Economist article on this sting begins with a focus on the Sokal hoax; this was a subscription journal, not OA, so not focusing too strongly on OA is much appreciated by the OA movement. Kudos to the Economist for picking up what Science should have. However, this means that an Economist article is focusing on a critique of scholarly peer review rather than a problem with a small set of journals. This article illustrates what I consider to be a potential danger to all of scholarship / science, not just open access. Here we have a newspaper article quoting a study as saying that the majority of peer-reviewed journals will accept an article that is obviously fabricated. It is not hard to imagine newspaper articles like this being used as fodder for climate change denial types. To me, this in itself illustrates the need for careful quality control in scholarly communication. It is unethical for Bohannon and Science to publish an article that could so easily be misinterpreted in this way and used as arguments by opponents of science and scholarship. This is a bigger problem for science and scholarship than all of the predatory journals exposed by the Bohannon sting. In conclusion: the Bohannon sting provides welcome evidence supporting Beall's qualitative evidence of serious problems with a small sub-set of new publishers who happen to be open access publishers. The study is not generalizable, the article was not peer-reviewed and should not have passed peer review in its current form. At minimum, every effort should have been made to ensure that readers understood the limitations of the study (small percentage of OA journals, non-generalizable study), and referred to literature on similar hoaxes that were accepted by subscription journals in the past. The University of Alberta is just one of many universities that has gone through (or will go through) deep cuts in recent years. The U of A's recent cost-cutting exercise has resulted in 121 voluntary severance packages, including: 83 Faculty, Faculty Service Officers, and Librarians, and 38 Administrative Professional Officers. Meanwhile the scholarly publishing industry which benefits from the free work of scholars as authors and peer reviewers are so enjoying an inelastic market (one that does not respond to market conditions like your customers facing such deep cuts) that they are acting like things are business as usual. For the scholarly publishing business, this means price increases year after year - in this case serials subscriptions agent EBSCO is reporting that libraries should expect increases in the range of 6 - 8%. Not only that, but cheerfully double-dipping: pocketing cash for open access article processing fees which are meant to cover the cost of publishing articles so that they can be made open access. It is time for scholars, university administrators and research funders to wake up and realize that creation of new knowledge is done by researchers, not publishers. Don't give up your job or or let your colleagues give up theirs without demanding that the large commercial scholarly publishers give up their 30-40% profit margins. The economics of scholarly publishing is a topic covered in my dissertation. This post is the first in a new scholars jobs not publisher profits series. In the interests of open research, here is a project that I'm considering for the near future. To avoid any confusion, please remember that the vast majority of open access journals do not charge article processing fees. The purpose of this research is to track the fees themselves for those journals that do, to note evidence of competition (e.g. new low-cost approaches), reactions of publishers to substantive surpluses (such as PLoS' apparent comfort with retaining current prices in spite of a 23% surplus, and to establish a benchmark for existing article processing fees and to track these over time, similar to the Library Journals Serials Price Survey, to keep an eye out for unwarranted price increases. is anyone else already doing this? Comments welcome. Please note the IJPE commenting policy: this is a scholarly blog. Comments must be attributed (get in touch with me off-blog if you have a substantial comment and a good reason to request confidentiality), and any potential conflicts of interest must be noted. For example, if you are involved with a publisher / journal that charges OA article processing fees, this should be stated in your comment. Update October 3 - on the open research approach - so far, in less than 24 hours, I have substantive comments via e-mail from 4 experts in the field, including one with an interest in collaborating. I will limit acknowledgements at this point to comments posted to public lists or at the request of the contributor in the case of personal e-mails, but wanted to note that from my perspective the open approach on this project is already succeeding - but please keep the comments and suggestions coming! proceed) over the next few months but any changes to this will not be quick. This post is part of the essential efficiences series. As noted on this Library and Archives Canada website, LAC and Canadiana are partnering to digitize Canada's heritage - and sell subscriptions to the metadata that would be necessary for anyone wanting to make use of this collection, both to libraries and to individuals. Canadiana.org also will also transcribe millions of handwritten pages, and create related descriptions. Enhanced search tools facilitating access to these records will be available to Canadians free of charge at LAC, as well as at hundreds of subscribing libraries in regions across Canada. For a small monthly fee, Canadians will also be able to use the enhanced tools online to conduct advanced searches without leaving home. This essentially privatizes public materials. The works that are being digitized were collected by Library and Archives Canada as a public service on behalf of Canadians. Neither Library and Archives Canada nor the partner libraries have any right to sell a search service built on these collections. To illustrate what is wrong with this picture, consider the history / ancestry of individual Canadians and communities that is reflected in these collections. By selling subscriptions, Canadiana and LAC essentially ensure that those at elite universities and wealthy regions whose public libraries can afford subscriptions, or who can afford individual subscriptions, have access, while other Canadians are largely left out. In some cases the history of a community will be much more readily available to wealthy, well-connected (in an internet sense) people outside the community than those in the community themselves. This puts libraries in the role of search service development business. This is an appropriate role for library vendors like EBSCO, ProQuest and Elsevier; but it is not an appropriate role for libraries. If libraries go this route, they should expect to lose public support, and be in a poor position to fight private sector library takeovers. To put this another way: if libraries become businesses, they are no longer libraries. This is being positioned as open access after a 10-year embargo. Libraries and partner organizations around the world have been advocating for open access for about a decade. The current most common maximum embargo is 1 year, and there is a push to reduce this to 6 months. So what are libraries thinking developing a project they call open access with a 10-year embargo? Canadiana, library partners of Canadiana, and Library and Archives Canada: please drop this approach and provide full, real, immediate open access to the search service and metadata developed from this or future projects. This is our heritage, our collection built with public funding for the public. If we cannot afford this right now - the works have been microfilmed and are stored in many locations. That means, from a preservation perspective, we have a few centuries to do this right. Bibliocracy - Canadiana & LAC - paywalling Canadian heritage?